Expand your comfort zone and conquer your fears. Caving is something you must experience a least once in your lifetime. Kitted out with caving suits and lights you will explore the naturally formed caverns and passages of this amazing underground world. A great activity for teamwork combining communication skills and group awareness.. You will learn about cave formation and its inhabitants. Available as a full day activity or half day if combined with Gorge Adventure. Based around Hay-on-Wye in the surrounding hills, mountainboarding is an exhilarating and progressive activity, a mix between snowboarding and skateboarding. Taught at beginners level you will start at the bottom of the hill and work your way up. How high you go depends on your skills ( decided by your instructor ) and your confidence. You will be given a board, a full set of safety pads and a helmet. This is a dry weather activity and available as a half day session. What a fantastic area to go hill walking. Whatever your level of ability and fitness there will be fabulous walking to suit you. From the soft contours of the Radnorshire hills to the more rugged Black Mountains and Brecon Beacons. Whether you are looking for the challenge of distance and elevation or a more gentle walk taking in some glorious views we will work with you to sort a route to suit. 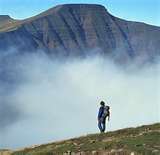 Need more confidence about being out on the hills, we will incorporate hill walking skills and navigation in different conditions.